"The Selling Has Just Begun"
“The most important trade of the past decade is now reversing,” shrieks Charlie McElligott, head of Nomura’s cross-asset strategy. Since last Friday the S&P technology sector lost $350 billion of artificial wealth… swept away to the Land of Wind and Dust, the graveyard of illusions. Facebook has absorbed the heartiest slating of the bunch. Twitter, with disappointing second-quarter earnings of its own, follows. The S&P’s five largest companies — Apple, Amazon, Alphabet (Google), Microsoft and Facebook — boast a combined market cap exceeding $4 trillion. These five technology stocks thus equal the market cap of the index’s bottom 282 companies… combined. The S&P is up 5% year to date. But were you aware that 73% of S&P stocks are down at least 5% this year? Or that 49% are down 10% or more? It is true — our agents confirm it. Ten stocks alone account for 100% of the S&P’s yearly gains — and six of these wagon-pullers have been technology stocks. Rarely before, we conclude, have so many investors… owed so much… to so few stocks. But what if these market supporters crack under the strain and throw off the burden of leadership? Will anyone carry the standard forward? Passive, because it rises or falls with the prevailing tide. Technology stocks like Facebook have lifted markets on a flowing tide of momentum. Much of Wall Street has poured into these stocks… sat back on its oars… and let the current take markets to record highs. When the tide recedes… it recedes. And the same handful of stocks can wash the market out to sea, quick as a wink. Panic selling begets panic selling, and where it ends is an awful mystery. What matters is the array of traders, all leaning over one side of the boat, suddenly running to the other side of the boat before the vessel capsizes. The technical name for this kind of spontaneous crowd behavior is hypersynchronicity, but it’s just as helpful to think of it as a herd of wildebeest that suddenly stampede as one at the first scent of an approaching lion. The last one to run is mostly likely to be eaten alive. When the “herding” into ETFs begins to reverse, it will not be a slow and methodical process but rather a stampede with little regard to price, valuation or fundamental measures. 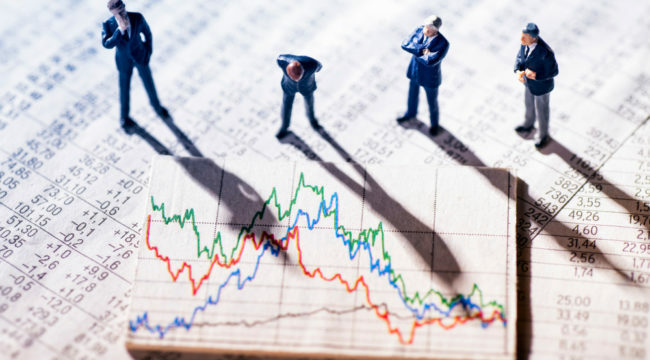 Importantly, as prices decline it will trigger margin calls, which will induce more indiscriminate selling… As investors are forced to dump positions… the lack of buyers will form a vacuum causing rapid price declines which leave investors helpless on the sidelines watching years of capital appreciation vanish in moments. Roberts and Lebowitz remind that investors lost 29% of their capital over a three-week span in 2008 — and 44% over three months. “This is what happens during a margin liquidation event,” they conclude. We can of course provide no timeline for the described phenomenon. Nor, for the matter of that, can anyone else. Bu we have argued against a general catastrophe this year. We believe the ultimate reckoning may wait until next year… or the year following. Because we first expect a “melt-up” — that final manic, incandescent phase bull markets enter before the inevitable melt-down. And these conditions do not obtain today. We admit the possibility of an impending correction as Morgan Stanley predicts — but why, we wonder, can markets only “correct” lower? If a 10% market fall is a correction, is a 10% increase an incorrection? And if the S&P was correct when it plunged 10% in February… must we conclude any subsequent rise has been incorrect? We may soon have our answers. Regardless, more questions will follow in the days ahead… and some may bring unsatisfying answers.